Starting a couple of weeks ago, or so, Google's Chrome browser started displaying italics instead of the browser default font. It was especially annoying when using Google Docs, since there was no distinguishing the default font from intentional italics settings. Upon further examination, the symptom varied somewhat depending on what the page was calling for. Checking the font settings in the Chrome browser itself turned up nothing new. Disabling extensions didn't help. Google search for this problem mainly turned up threads in Google Groups. These called for reinstalling Windows fonts or tweaking Windows settings. None of these sorts of solutions worked -- as they didn't apply. Further, the symptom does not appear in other browsers on the subject computer. After several days of testing, a Yahoo Answers post provided the answer to the Chrome default font italics mystery. 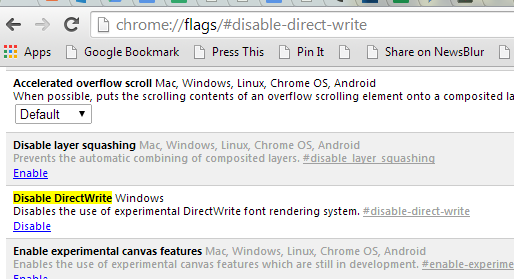 Google's Chrome team is rolling out support for Windows DirectWrite and in this version, the release fails under some circumstances. Stayed tuned for commentary on this scenario at SoftwareQC.com. Configuration Windows 7 Pro, Intel i7, Chrome Version 37.0.2062.120 m.